Indian Defense Minister Manohar Parrikar briefed the press on the Rafale deal on April 13, 2015. During the course of his brief and a subsequent interview with NDTV, Parrikar revealed the following important details about Rafale's performance. 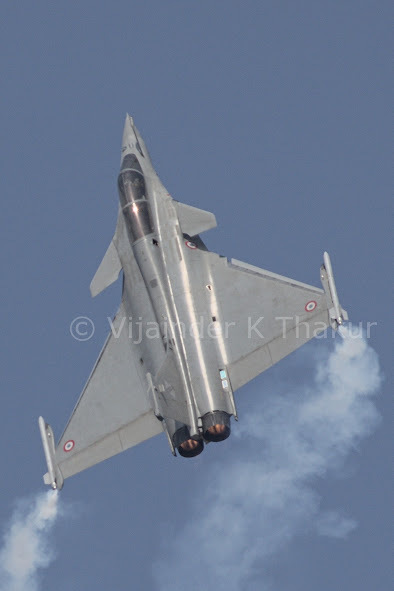 Rafale can carry twice the payload (24 tonnes) as the Tejas (10-12 tonnes). Rafale's 1000-km combat radius far exceed the 300-450 km combat radius of existing IAF aircraft. Rafale has a greater loiter time than any other Indian fighter. Rafale's weapons are superior to those of competing aircraft. Rafale is equipped to penetrate heavily contested airspace without the need for Suppression of Enemy Air Defences (SEAD) platforms. Rafale's integrated defensive-aids system named SPECTRA, developed as a joint venture between Thales and MBDA, protects the aircraft against airborne and ground threats. It features several methods of detection, jamming, and decoying and can be quickly reprogrammed to address new threats and incorporate additional sub-systems in the future. During Operations over Libya, French Rafales reportedly operated independently of SEAD platforms. Rafale is designed for reduced radar cross-section (RCS) and IR signature, though it does not feature all aspect stealth. The aircraft's stealthy features include reduced size of the tail-fin, fuselage shaping, under-wing air intake positioning, extensive use of composites, and serrated patterns for the construction of the trailing edges of the wings and canards. Many RCS reduction features are classified. Sensor fusion facilitates single pilot operations and more efficient use of weapons. Better WVR combat performance during initial (first 40-s) engagement.